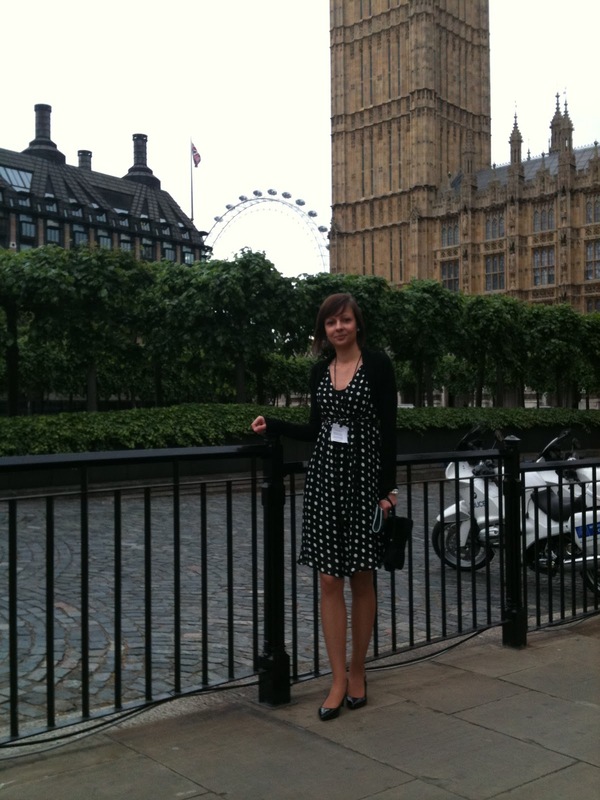 London – 11th May 2011; the House of Commons (HoC) terrace. My recent blog entries have primarily been light-hearted. In fact some confused but supportive souls have even described them as humorous. This one isn’t. Thought I’d warn you at the outset. I will start though by thanking Sara Benson at MDC for allowing us the privilege – you are a star, a wonderful asset to MDC and above all else, a credit to yourself as a person. I’m richer for having met you and your enthusiasm is infectious. The reason I’m going to the North Pole Trek, doing all my tyre-dragging and nagging the crap out of people for donations, the reason I wrote cheques in the past, and the whole purpose of the Involve ethos to help people, all became very real last Wednesday when I was so very kindly invited to a Parliamentary reception by the Muscular Dystrophy Campaign. The following descriptions drew a very sharp contrast in my mind once we'd met some unspeakably brave yet modest individuals. In fact writing it now does make some of the contrasts a little absurd. So picture this; Lucia and I took the train down to London on Monday evening after work. We arrived at our lovely hotel (K West in Shepherds Bush) and our amazing room which could probably have doubled as a mini-conference hall - did I really book this room or is it a free upgrade from cattleshed to Palace? Tuesday was hot and sunny and we had brunch in the sunshine at Covent Garden whilst watching the professional street performers, went on the London Eye, walked through St James Park to Buckingham Palace and then spent an hour sat in deckchairs in the park before strolling back to our hotel, changing and heading out to the theatre. Back from the theatre, tired but thrilled after an exciting and well-earned day of rest, we were ready for our much-anticipated first-ever visit to the internal workings of the Houses of Parliament. 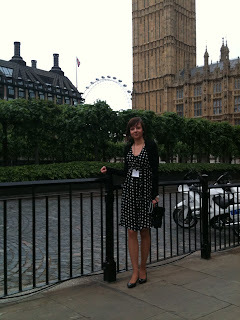 The next day we changed into suitable attire, decided to take a cab to the HoC and arrived at the defensive concrete walls and myriad of traffic-calming Police-guarded entrances. After passing through security we entered a magnificent building, almost cathedral-like and were dutifully guided through lavish corridors, passed small dining rooms with cutlery, wine glasses, fine china plates and even chairs emblazoned with the HoC portcullis. Canapes, fine tea and fresh coffees were being served and a variety of people were gathered from Professors, leading campaigners, politicians, charity executives, fundraisers and sufferers alike. Lots of polite applause for short witty ‘rah-rah’ speeches, a robust explanation of the piece of research they were launching to the cross-party group of Parliamentarians for neuro-muscular care and the wonderful Lord Waltham hosting the event; a sprightly sharp-minded host of 89 who would put most 60-year olds to shame. All good, all lovely and with a few hectic campaigners darting here and there to suggest photo shots and whispered words of “We’ve got Margaret Beckett coming in here” and “Wish that Michael Winner would have his photograph taken somewhere other than outside our terrace” to add to the lighthearted melee. In fact it's at this point that the excesses I've described in the paragraphs above sound, in retrospect, a little appalling - and were written to generate this stark contrast in my emotions. A key part of the visit was for us to understand a little more and to meet some wonderful people, and that we certainly did. Christine from Bolton who works tirelessly as a result of her grandson having Duchenne; she gave me many words of wisdom not least on fundraising and is clearly passionate and focused. She told us of one couple who had a boy with Duchenne but before he was diagnosed they went on to have a further 2 boys. Now they know that all 3 are dying because early-pregnancy screening was unavailable. Jane Field from the Midlands Muscle Group whose speech was truly succinct yet focused, passionate and deserving of every piece of applause she earned. And then there was Aaron and Jon. Aaron has Muscular Dystrophy; not the terminal variety but he has spent years in a wheelchair having tests to try to find out which of the 70 variants of MD he suffers from. Until that is diagnosed his future remains somewhat uncertain but he clearly enjoys life and his current carer, Linda, is trying to persuade him to get a Pug (it’s a dog, evidently). I don’t like them but Aaron was so enthusiastic in his encouragement for Lucia to drag me round the shops I had no choice but to support Linda’s request that he buys one. Revenge is mine Aaron ha ha. Jon has Duchenne. He knows his MD is terminal but continues to talk passionately about working life (his carer Jan – a friendly Slovakian who smiled broadly when he found out Lucia is a fellow Slovak – helps Jon to do his work) and although he doesn’t have the strength any more to lift his hand from the control on his wheelchair, his gentle grip was open and heartfelt. Jon seemed to have a little difficulty breathing and talking; a symptom of his weakening muscles yet he was so enthusiastic about the research he is co-ordinating and about how his daily life is manageable with his 3 carers what will one day probably require 5 or 6. At 30 years of age I assume Jon has possibly 5 more years before this terrible disease makes his lungs and heart too weak to work. I cannot imagine what he must deal with every single day of his life and I wish I had even a small piece of his amazing courage. I’m sure if I did I’d probably SWIM to the Pole. And so we left the HoC and I have promised to keep in touch with them both (I emailed them as we travelled home; just hope my unknown email address doesn’t take my e-mail into a ‘trash’ folder). We also left knowing that we want to get in touch with some other people Lucia knows who have to deal with MS every day of their lives, because only then does it hit home, only then do the tears well in my eyes when I realise just how bloody lucky I am in life. I will get to the Pole, my fingers may be blistered from typing letters rather than from frostbite, I will work so hard to get £100 000 raised for the charities I’m supporting and to be able to personally pay for the £25 000 cost of the trek if no corporate sponsors emerge. In a bit of a Sir Bob Geldoff moment I’d ask you to now stop reading this blog and ask why on earth you CANNOT put your hand in your pocket and donate today? Yes it’s 50 weeks until I’m at the Pole which seems at long time away, yes you too have pressures in your life just as I have in mine with family, work, bills, mortgage, economic fears and the emotional issues our friends bring and take from our shoulders but can you truly say you cannot afford to make a donation right now? It is not for me to tell you what to do, what to forego and what your priorities are but if you do feel some of the passion in my words, understand a little more about how far-removed we are from some of the pressures our fellow human beings have when we enjoy lifes luxuries and if you have that momentary surge of desire/guilt/passion/humility/humiliation (delete as you see fit) then please, right now, go to either of the following and be generous. For one day you or one of your family just might benefit from such simple generosity. I hope none of us need to but I fear some of us might. Thank you, from me, from those suffering and in need of our respect as well as our support. More from tyre-heaven and the 'Twitchers' over the weekend no doubt but, for now ..... pause and think.